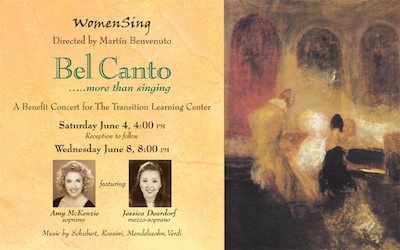 WomenSing’s Bel Canto concerts will benefit the music and arts program for the Transition Learning Center in San Pablo. This unique and successful program works with children in the West Contra Costa Unified School District who are unable to attend regular school because of emotional or behavioral problems. Bel Canto features choral literature that came to be as a result of the wonderful exploration of the voice and its possibilities. Works include Franz Schubert’s Psalm 23, Mendelssohn’s Laudate Pueri Dominum, Rossini’s La fede, La speranza and La Carità, Verdi’s glorious Laudi alla vergine Maria, and a delightful Polka duet by American composer Faustina Hasse Hodges. In this April 10 special appearance, WomenSing will perform in the distinguished Sunday afternoon concert series at the National Shrine of Saint Francis of Assisi in San Francisco. The concert will include Johannes Brahms’ Four Songs for Women’s Chorus, Two Horns, and Harp and Benjamin Britten’s Missa Brevis in D, accompanied by noted composer and organist Mark Winges. We look forward to lifting our voices in this glorious space, and we hope you will come along to enjoy the music and the history of this splendid San Francisco landmark. 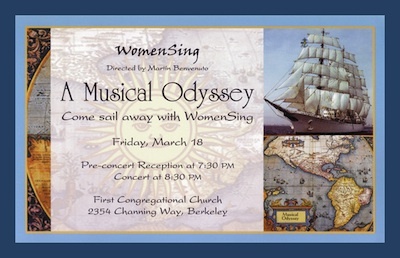 As WomenSing prepares for a concert tour of Argentina in April 2005, a pre-tour performance will present the tastes and sounds of that South American country. Taste is a prelude to the concert: complimentary Argentinean wine and handmade empanadas will be served to concertgoers. In A Musical Odyssey, WomenSing’s Artistic Director Martín Benvenuto begins the concert with the European tradition of Josef Rheinberger’s Regina Coeli and Benjamin Britten’s Missa Brevis (both for treble voices and organ), along with a collection of folk songs from the British Isles. The musical voyage then sails across the Atlantic Ocean to North America with selections from Aaron Copland and Kirke Mechem. Finally, the journey leads south to a set of Argentinean music: Emilio Dublanc’s neo-romantic La Estrella, Pablo Ortiz’s Bendicion (Ortiz, an Argentinean composer, is a music professor at UC Davis. ), Alberto Favero’s lyrical Te Quiero and Chacho Echenique’s rhythmical Doña Ubensa. Angels Are Everywhere features music for women’s voices and brass, including Christmas Cantata and Angels Are Everywhere by Daniel Pinkham. The concert also includes works by Fauré, Saint-Saens, Randall Thompson, Karai, and P.D.Q. Bach.